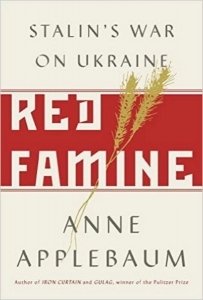 In Red Famine: Stalin’s War on Ukraine, Anne Applebaum offers a new comprehensive account of the Holodomor: the famine that led to the deaths of millions of Ukrainians through starvation in the early 1930s. Drawing on archival documents, written and oral testimonies and historical scholarship, this is a valuable addition to our understanding of this devastating and long-neglected event, reccommends Vlad Onaciu. If you are interested in this review, you may like to listen to a podcast of Anne Applebaum’s lecture ‘Red Famine: Stalin’s War on Ukraine, and Why it Still Matters’, recorded at LSE on 4 October 2017. Red Famine: Stalin’s War on Ukraine. Anne Applebaum. Penguin. 2017. The historiography on Soviet crimes is quite abundant, offering myriad interpretations throughout the Cold War and in the period after it. Anne Applebaum’s Red Famine: Stalin’s War on Ukraine is a new addition to this scholarship, focusing on the tragedy which befell the Ukrainian people under Joseph Stalin’s rule: namely, the Holodomor. This term has been used to define the genocide through hunger perpetrated between 1932 and 1933, causing the deaths of anywhere between 2 million and 12 million people. Some scholars have denied this description of the event by arguing that it was part of a wider famine, which hit other regions as well (Kazakhstan and the North Caucasus), although it is difficult to ignore Stalin’s disdain for Ukrainians, as expressed in his letters to Soviet politican Lazar Kaganovich. Anne Applebaum’s book stands as a synthesis of what has so far been researched, in terms of both archival documents and the expert analysis of various historians. As in her previous studies, she has combined this with written and oral testimonies, leading to a vivid account of the Holodomor. She makes an argument for its genocidal character, yet avoids a conclusion when it comes to the number of dead, arguing that the relative bureaucratic chaos of collectivisation and the Holodomor makes such an assessment impossible. The author’s interest in the communist world is anything but new. Presently a Professor in Practice at the London School of Economics but with a journalist background, Applebaum’s first book was the Pulitzer-winning Gulag: A History, in which she analysed the Soviet system of forced labour camps, drawing upon the accounts of its victims. Another major contribution is The Iron Curtain, an in-depth analysis of how the communist regimes in Eastern and Central Europe not only took over politics, but also society. In Red Famine, Applebaum analyses the struggle of the Ukrainian diaspora to make known their national tragedy. The subject first came to public awareness with the 1985 Harvest of Despair documentary. A year later, Robert Conquest published the book Harvest of Sorrow, which was based on the research undertaken at the Ukrainian Research Institute at Harvard University, generating debates regarding the ethnicity of the dead and their estimated numbers in the absence of relevant primary sources. In the following decades, the number of academic publications focusing on these crimes increased. Among these, it is particularly worthwhile to mention Timothy Snyder’s Bloodlands, Norman Naimark’s Stalin’s Genocides and Terry Martin’s The Affirmative Action Empire. All three emphasise the role that Ukrainian identity played in Stalin’s decisions. Applebaum takes the same approach, focusing on the Bolshevik attitude towards the nationalities drawn together under the Soviet Union, while also explaining how collectivisation became a backdrop to genocide. Applebaum’s analysis of Ukrainian identity starts from the time of the Polish-Lithuanian Commonwealth in the sixteenth century and the Tsarist Empire (from as early as the ninth century, starting with the Kievan Rus, up to 1917). She argues that in both Polish and Russian, Ukrainian means ‘borderland’: this came to illustrate the future downplay of the distinctiveness of the Ukrainian nation. Moving forward in time to the first years of the Soviet Union, she attempts to explain the paradoxical Bolshevik attitude towards this part of their new empire. Firstly, the experience of the Civil War came to shape the Soviet view of both external and hidden internal enemies. This was a time marked by extreme unrest and division in Ukraine as three big armies fought with little regard for the population. This led to an obvious lack of trust between the emerging national movement (mostly a peasant movement, including the ill-fated 1917-21 Ukrainian People’s Republic) and the Moscow-led Communists. Yet it was something of an ambivalent attitude, as Bolshevik ideology also supported autonomy for the Soviet republics, and for almost a decade there was an effort made towards developing Ukrainian culture and identity. But, by the end of the 1920s, there were clear signs that the central authorities were planning to close this down. While the ‘Shakhty Trial’ has become the preferred example for Soviet show trials against supposed saboteurs, little attention has been given to the trial of the ‘Spilka Vyzvolenia Ukrainy’ (SVO – Union for the Liberation of Ukraine). This saw around 30,000 people placed under arrest (mostly members of the elite), and marked the beginning of the attack on Ukrainian nationalism and its leadership. In the book, Applebaum manages to illustrate the difference between official discourse and Stalin’s actual paranoia-driven intentions towards internal enemies. Here, we arrive at the second defining element of the book’s interpretation: collectivisation as the background to the genocide. There has been a tendency in some parts of the historiography (especially in Russia) to explain at least some aspects of the famine through the policies of collectivisation, in a sense making it an unwanted or ignored consequence. While Applebaum accepts that this did in fact worsen the situation of the peasantry, she argues that there was more to the policy. As the food shortages increased, people began reacting in a hostile manner towards the regime, but they were in an already-weakened state due to the annihilation of the elites in the SVU trial. This led to arrests and deportations, while peasants fled to cities. It is here that collectivisation in Ukraine took a genocidal turn according to Applebaum, as in 1932 Stalin installed a repressive system involving the harsh requisitioning of food, the blacklisting of individuals and the closing down of borders. She ties these efforts of the regime into a double-faceted phenomenon. On the one hand, the regime aimed at breaking any remaining resistance, something which was achieved. On the other, blocking migration was an attempt at hiding the scale of the Ukrainian tragedy to protect the official image of economic and social progress. In reality, as acknowledged in the introduction, Stalin’s policies in Ukraine left millions dead, and the survivors traumatised. There is little criticism that can be brought to the approach of Red Famine. One issue that could have been better explored is the Polish element to Stalin’s paranoia. While it is mentioned on several occasions, usually in reference to past Ukrainian experience and accounts of the Holodomor, Applebaum does not define it in relation to the regime’s motivations. This aspect is relevant to understanding Stalin’s offensive: there was a genuine fear among the Bolsheviks that Polish national ambitions could pose a threat to the Soviet Union’s territorial integrity. This only served to further increase Stalin’s paranoia with regards to hidden enemies, convincing him that there was a need for a cleansing of Ukraine. Nonetheless, Red Famine is certainly a very useful addition to the existing historiography, offering a gripping account of the disaster befalling the Ukrainian nation in the early 1930s. Vlad Onaciu is a PhD student in the Faculty of History and Philosophy at Babes-Bolyai University, where he previously finished his BA and MA in contemporary history. His doctoral research focuses on issues regarding the lives of workers in factories during the communist regime in Romania. His academic interests include the history of communism, oral history, international relations (mainly civilisational studies) and nineteenth- and twentieth-century history in general. Read more by Vlad Onaciu.